Hi loves! Happy 4th of July to all my american friends hope you all are having a great day. 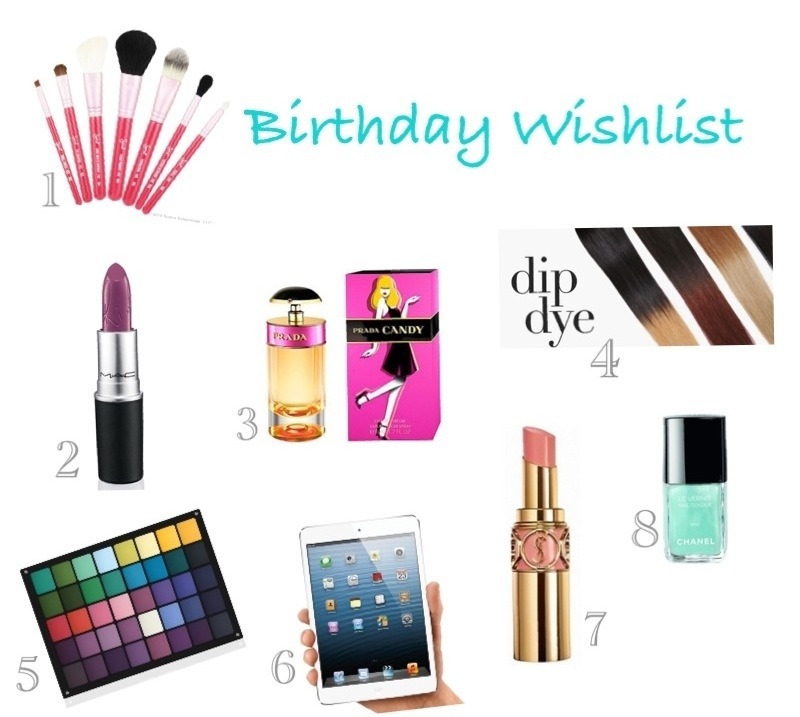 So my birthday is coming up soon so I thought it would be fun if I shared some of the items that’s on my wishlist. 1.Make Me Blush Travel Kit by Sigma is absolute must-have when traveling; This kit is the perfect size and it comes with all the necessary face and eye brushes that’s needed. 2.MAC RiRi Boy lipstick by MAC is a part of Rihanna’s MAC Hearts RiRi collection. RiRi Boy is such a gorgeous purple shade that I want to try. 3.Prada Candy perfume has a sweet and feminine scent that’s great for summer. 4.Dip Dye Extensions. I recently came across these extensions on Paul’s Hair World . These extensions would be great for me who isn’t too sure whether to ombré my hair or not. Paul’s Hair World has varaity of gorgeous hair extensions that are very affordable. 6.Apple IPad Mini. I’m currently using my phone to edit picture for my blog. It would definitely make blogging much easier. 7.Yves Saint Laurent nr 30 Faubourg Peach. I’m loving my YSL lipstick in Pink Lingire that I bought a few months ago. I would love to have this gorgeous shade as well. 8.Chanel Nouvelle Vague nail polish . This shade is the perfect colour for summer. I really need to find a dupe for this shade. Have you tried any of these items/products? I wear Prada Candy in the winter and just bought the L’AU.